There were two important reports on the U.S. economy released this morning. First, data from the Bureau of Economic Analysis (BEA) showed that U.S. gross domestic product (GDP) growth rebounded in the second quarter of 2017. Specifically, real GDP, which measures the value of the production of goods and services in America adjusted for price changes (inflation), increased at an annual rate of 2.6 percent in Q2. 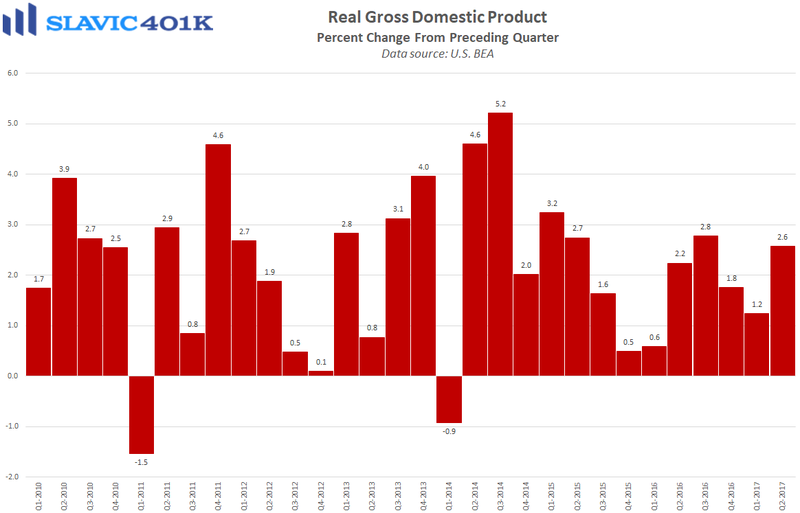 That was a welcome increase from Q1’s downward-revised 1.2 percent pace of expansion and the best quarter for economic growth since Q3 2016. The main drivers of last quarter’s rebound were stronger business investment in equipment and faster growth in consumer spending. One weak spot in Q2 was residential investment, which fell by the most since 2010 due in part to homebuilders grappling with a shortage of both skilled labor and available lots. Overall, though, this was a solid report that confirms that the slowdown at the start of 2017 was temporary. 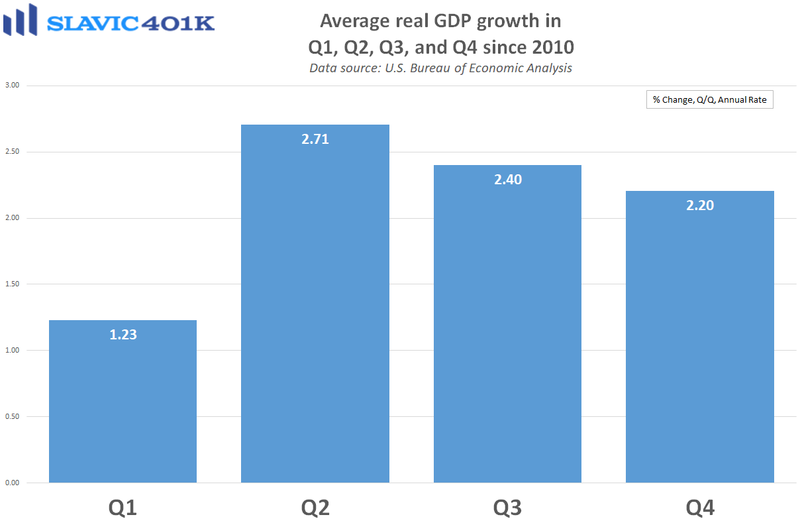 With GDP expanding by 1.9 percent during the first six months of the year, compared to a cycle average of 2.2 percent, it seems clear that the U.S. economy is still doing good but not great. Steady hiring, stronger income gains, and greater business investment will all be needed for faster GDP growth down the road. Elsewhere, a report from the Bureau of Labor Statistics (BLS) showed that total employment costs (employer-paid taxes such as Social Security and Medicare in addition to the costs of wages and benefits) in America grew at a slower rate in the second quarter of 2017. Specifically, total compensation costs for civilian workers lifted by 0.5 percent in Q2, below forecasts and a slight decline from the first quarter’s downward-revised 0.6 percent increase. 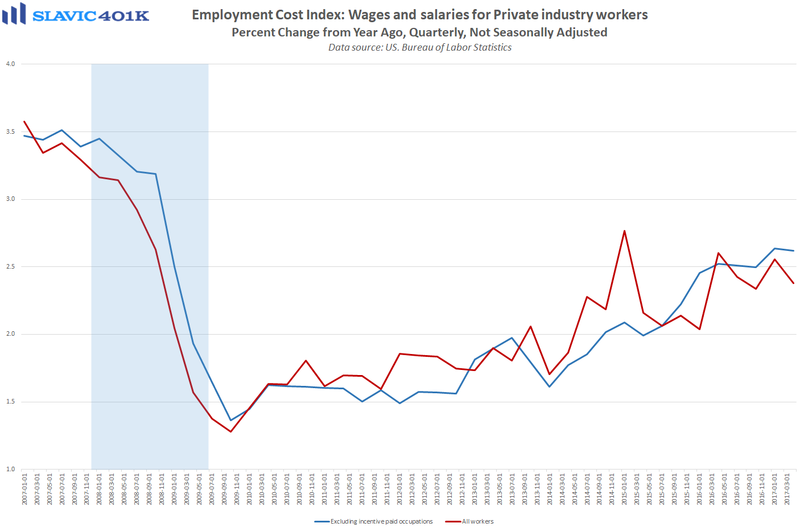 Wages and salaries, which make up about 70 percent of compensation costs, also lifted by 0.5 percent last quarter, while benefits rose by 0.6 percent. 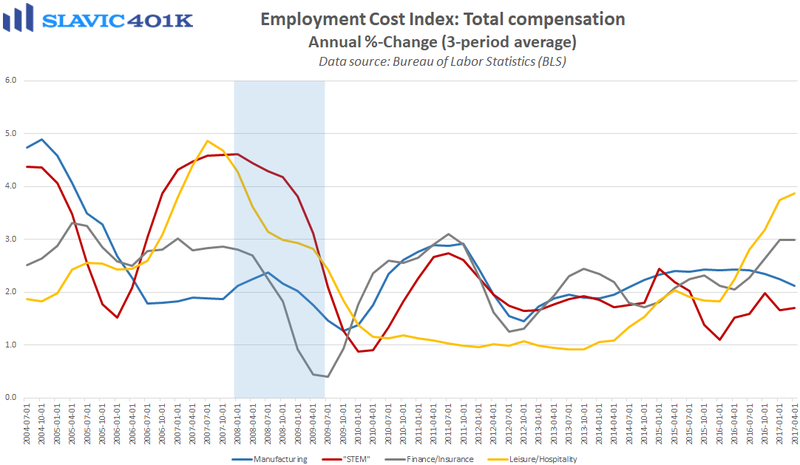 Compared to a year earlier, total compensation costs increased by 2.4 percent in Q2, down from 2.6 percent in the prior quarter and therefore still well below what has typically been seen during past expansions. 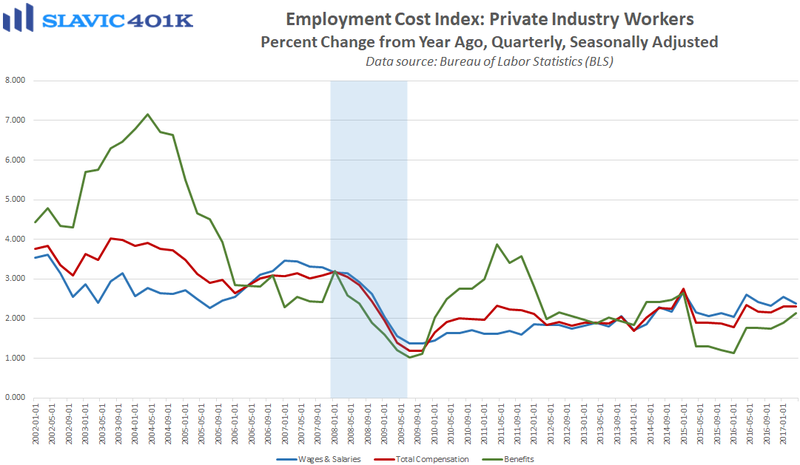 However, the ECI excluding incentive pay rose 2.6 percent in Q2 (y/y), little-changed from the cycle high for private-sector wage growth hit in the prior quarter. Going forward, the tightening labor market should continue to put more pressure on firms to boost employee compensation, which could be supportive of both consumer spending and inflation.